"As a child, Diane Thiberge had been the victim of an assault. Now aged 30, an ethnologist specialising in the study of predatory animals, and a woman adept in the martial arts, she believes she has at last found a meaning and purpose to her life when she decides to adopt a five-year-old Thai boy, Liu-San, whom she christens Lucien. On her reurn to France, however, Lucien is involved in an accident and is declared to be brain-dead. A series of murders make Diane realise that her son is no ordinary child, but someone who, through no fault of his own, has fallen prey to sinister paranormal forces. In a dénoument that takes her from Paris and Germany to the remote mountain fastnesses of Mongolia, she resolves to fight for her son's survival." I bought the book after reading, and enjoying, Grangé's Blood-Red Rivers. Unfortunately, I was disappointed. 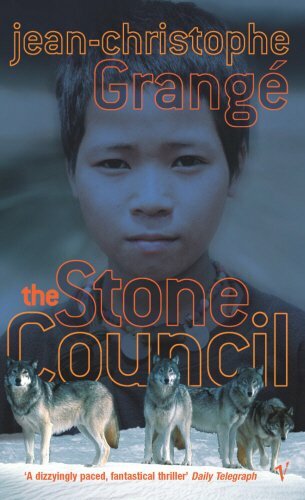 Ich habe The Stone Council gekauft, nachdem ich zuvor Die purpurnen Flüsse gelesen hatte, welches mir auch gefiel. Leider hat dieser Roman meine Erwartungen nicht erfüllt. I found it at OBCZ, Wuppertal on the free-book table this afternoon. The blurb sounds thrilling. Let´s see. The plot is exciting, but the end is slightly disappointing. Nevertheless, it´s worthwhile to read. I´ll set it free within the next two week, jet I don´t know where. Further on it makes me curious to read "The blood-red rivers". If someone wants to read more about sibirian schamanism, I recommend "Entering der Circle" (deutsch: Das weisse Land der Seele) by Olga Kharitidi.